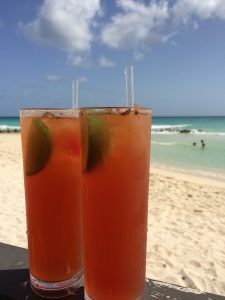 Behind the beautiful sunsets, beaches and glasses of rum punch lurk a few island dangers that you should be aware of in Barbados. Although there is nothing quite on the level in nature danger as Australia there are a few things that can pose a threat to you. This tree is believed to be the most dangerous tree in the world. It is extremely poisonous, in not one, but three ways. The apple looking fruit is highly toxic and can cause death. Do not stand under this tree when it rains as the sap is highly poisonous and can cause skin blisters and burns. Finally, the bark is poisonous and should not be burnt as it will release a toxic smoke that can temporarily cause blindness. In short, keep well away from this tree. Walk around it if necessary. Eating, touching, burning any part of it will not be good for you. They are normally marked with a red band or painted with a red ring with a warning sign too. 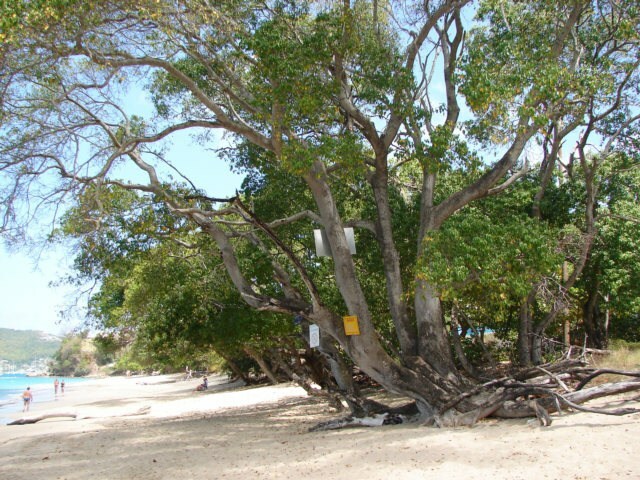 Some of these trees are on the beaches so keep a careful eye out for them. Turtles are a huge feature of Barbados. You can swim with them, feed them and see the baby ones released into the sea. However, you should also realise that turtles feast on jelly fish. Where there are turtles, there are jelly fish. 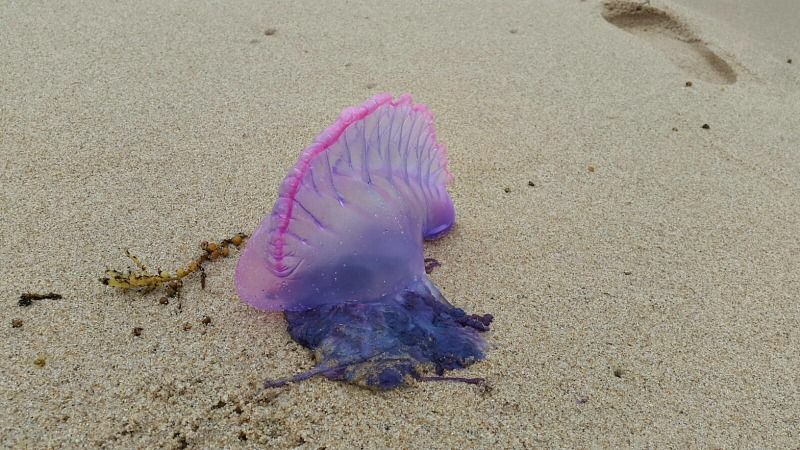 A nasty jelly fish in the local waters is the Portuguese Man O War. These brightly coloured jellyfish may look like party balloons but they have a serious sting and for some people can be fatal. The giant centipedes in Barbados should be avoided as they have a nasty bite. Some people and small children can have allergic reactions to the bite too. These centipedes are feared on the island and if you wanted to disperse a group of men just point to the ground and shout “Centipede”. They will run faster than Usain Bolt. Barbados roads are mainly full of potholes and not very well maintained. When it rains, the water will bring up more potholes too. Don’t be deceived by the puddles and they could be hiding a small crater that will take out the suspension on your car. Walking along the roads at night can be a dangerous sport too. There are not many foot paths so you have to walk along the roads amongst the oncoming traffic, avoiding the storm drains as well as the drivers. Wear bright clothes so you can be seen. Suddenly that dayglo yellow top comes into its own. They are stronger than you think. They may not taste deadly but if you lose count of how many you have drank you will regret it in the morning. You may even lose a part of the evening. Friends and family will happily put the pieces of your black out together. Try to avoid the morning of rum shame and take it easy with them. No beach holiday destination is complete without the beach hawkers and lothario’s trying to charm you and your wallet. In general, the beach hawkers will move on once you politely say “no”. Mind you, our experience of them is probably due to my husband being a large man who often gets mistaken for a boxer. He once got mobbed at the pyramids in Cairo, but that’s another story. However, there are certain brand of beach stalker that will hunt down it’s mature female prey, with smooth talk and empty promises. There are certain beach bars on the south coast they will be looking out for their next sugar mummy. Just no. Same for walking along the south coast boardwalk late at night. Unless you like handing your wallet and mobile phone over to strangers. Then go ahead! Make their day!